I love eating Mango. I can finish one all by myself if Mamarazzi didn't stop me. But one thing hor...after eating mango, my bum bum kept going "proot! Proot! Proot!". Each time "proot" I would laugh but Mamarazzi would scold me for being disgusting. Hahaha...proot!!! good to release some wind! Mangoes are real delicious...especially the sweet ones. He He he, I also like mango.....sour ones taste good with some salt! hahaha... Small Kucing, "proot" when no ppl aroud then Mamarazzi won't scold u! Thx for dropping-by, I love to read your blog! Looks so happy enjoying the mango! 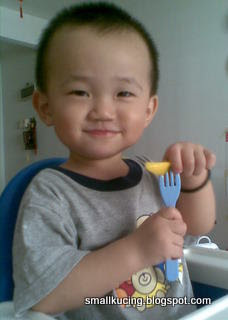 LPM & Wonderful Life: He loves to eat fruits. Daren't give him much as I worry about cough. Hi Small Kuching, love that cheeky look of your boy. He's good looking....wait till he's 17, girls will have to take a number, ha ha. Have a pleasant week, Lee. Thanks Wenn and Uncle Lee. You have a pleasant weekend too. Happy Halloween! 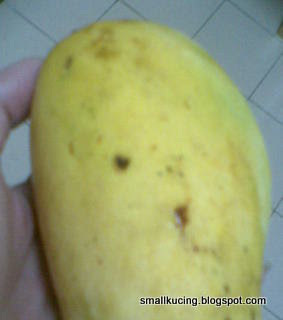 Smallkucing, i love mango too... in fact, can make cake with mango.. wanna try? hey..my comment is missing again.. just minutes ago, i wrote..
i said i love mango too and can even bake a cake with mango toppings.. nice...!